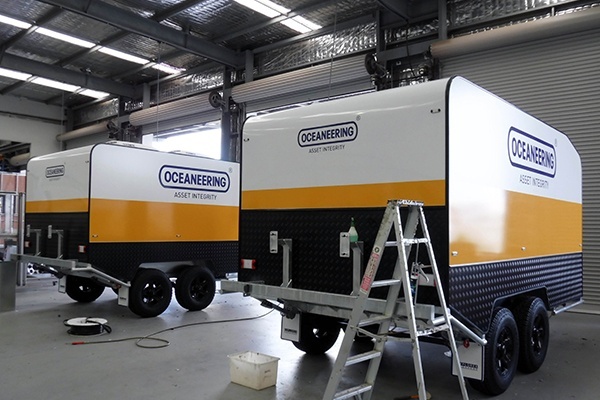 Signarama Joondalup & Osborne Park specialise in the design, manufacture, and application of caravan and recreational vehicle (RV) graphics and signage. We are suppliers to some of the largest caravan companies within Australia with a large suite of custom graphics designed by our highly talented caravan and RV graphics Design Team. The best designed graphics are only of use if they are produced from the correct products, fit for purpose. As a 3M Certified Advanced Applicator Team, we only use quality Vehicle Grade 3M conformable vinyl graphics and matching 3M overlaminate. If you are a caravan company that needs some new and innovative designs to go on to your recreational vehicles, or you are looking for a professional signage and graphics company to design, cut and apply your graphics for you, we can certainly assist. You perhaps may not have an in-house caravan decals design and application department. No problem. We are happy to assist with design to help your vans stand out from the crowd. Also, we can provide professional 3M certified graphics applicators to work on your production line for you, as required. There are many caravan and RV manufacturers in Australia. It is important that you try to make your vans stand out far better that the traditional ‘squiggly lines’ or standard pin striping approach. Today’s consumer is far more demanding, and swayed by the aesthetics of the van. I have my favourite family photo that I would love to put on the side of my caravan. Can this be done? We have done this for a number of our clients. What a great way to customise and personalise your caravan. We are a Caravan / Camper / Camper Trailer / RV manufacturer. Do you have capabilities to design, manufacture and apply our graphics on a manufacturing production line? Yes, we do. We custom make caravan decals and apply them for a range of Australian RV manufacturers. From smaller operations, to some of Australia’s largest. We are also able to ship these graphics Australia-wide. Also, we have a design team who are specialists in designing appropriate graphics for caravans, camper trailers and other recreational vehicles. Can caravans or camper trailers be cleaned as normal when they have graphics on them? Yes. Our 3M vinyl graphics are designed for long term use outdoors. All we suggest is washing the van as per normal, but perhaps not blasting it full pressure with a high pressure cleaner. Perth is home to a large number of boats. A boat wrap is an ideal way to spruce up the look of your boat. Whether you want to wrap your boat in your corporate logo and colouring, or you are just after a full colour boat wrap, the team at Signarama Joondalup/Osborne Park boat wraps are the ones to talk to. We have an in-house design team who can custom make and design your boat graphics, ready for you to approve prior to us applying the vinyl graphics to your boat. There is far more to getting a great result for your boat wrap than just coming up with a great design. Our graphic design team is highly skilled in designing a well-balanced and great looking graphic for your boat. Once the design process is completed, especially important is the correct production and application of your graphics. The first aspect to take in to consideration is the quality of the vinyl and matching over-laminate used. Perth is home to long hot summers, with extreme weather elements. The last thing you want to do is pay for a boat wrap, only to have it fade, peel, shrink or crack after a short time. We only use the highest quality 3M materials. We print with the highest quality HP wide format environmentally friendly printer, and then laminate your graphics with a matching 3M boat grade laminate. Of course, the best quality vinyl in the world is of little use if it is applied poorly. Our Application Team are trained and accredited to an Advanced Level by 3M. After your boat grade 3M film is applied, and heated in to the contours of your boat, we apply an edge sealer to further protect the film from water and salt incursion. After this process is completed, then your sparkling new looking boat is ready to take out on the water.